When using social media to advertise your business and products, there is power in pictures. Customers cannot touch or feel what you have to offer. Words and photos are the only way to promote your agritourism destination and persuade people to visit your farm and buy your products. Using the sun to your advantage tends to create warmth in the photo. However, avoid shooting with too much sunlight, as it can wash your subjects out and create strong shadows. Cloudy days often are great for taking photos; they defuse light and soften while showcasing rich colors. Avoid taking photos during the middle of the day. This can result in people squinting. When using flash, avoid shooting next to walls- you don’t want a shadow outlining your subject. Avoid using flash inside when you are exposed to reflective surfaces like mirrors or windows. If you can’t seem to get enough light, flash is a great way to get some. Not all flashes are powerful. For the flash to work properly, you will need to put your subject within the range of the flash. All subjects should be about the same distance from the flash- otherwise, some will appear over exposed while others will be under exposed. There are several reasons why your photos may be blurry, fuzzy or out of focus. It may an issue with your lenses or equipment, however the most common issue that occurs can easily be fixed. Make sure you are holding your camera correctly. Incorrectly supporting your camera can introduce camera shake and cause your photos to be blurry. Next, always make sure your lens is clean. Humidity, smears and fingermarks can create issues with photo quality. Lastly, a rule of thumb is to always focus your image first and resize later. Often the quality of the photo is lost because the photo is “zoomed in” too much without proper focusing. Create a large frame and edit or crop the photo after you capture a high-quality resolution. Often people place the subject of the photo dead center by default. 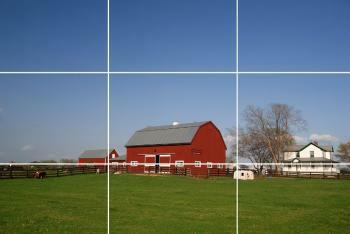 Instead, while framing your shot, visually break down the frame into a grid of nine equal rectangles. Then place your subject on one of the four intersections to create a natural look. The rule of thirds in photography is not a hard and fast rule, but a guideline to create more artistically composed photographs. Your photo will allow the viewer’s eyes to wander the frame and create a more interesting and eye appealing photo. When photographing your destination’s landscape, it’s important to create depth in your photo to make the viewer feel like they are there. Use a wide-angle lens or even the common setting “panoramic view”. It is important to capture both the foreground and background aspect of the frame. Placing an object or person in the foreground can help give a sense of scale and measure of distance. It is a good idea to take snapshots of visitors and the experiences they have while at your destination. However, it is important to remember a photo consent form is necessary if you are showing people’s faces. This can be a contract or a form that grants you permission as the photographer to use photos of your visitors for professional or personal use. Always ask the participants ahead of time, especially the guardian of children present in the photo. Click here to view a sample of a photo release form. Photography is a great way to help market your farm and your products. Good photography can help tell and showcase your agritourism destination’s story! For more information visit https://www.exposureguide.com/top-10-digital-photography-tips/.